Establish a distinct ambiance to any room. At Karen’s Carpetmax, we empower you to steer your interior design and remodeling efforts in bold directions. We are your source for area rugs in Flint, MI. Our flooring showroom offers a wealth of different decorative rugs and runners. Give any room a new atmosphere, all while saving time and money. As its name suggests, “area rugs” are floor coverings which cover a portion of your room. They are not meant to replace your current flooring. Rather, they elevate your interior design possibilities. Available in many different materials, colors, textures, and patterns, rugs are as beautiful as they are versatile. From large floor rugs to accent pieces, our showroom offers a wide selection of products that will take your interior design to new levels. From Old World aesthetics to contemporary sensibilities, our area rug store offers many different styles. Mix and match our rugs to create a look. If you aren’t sure where to start, then arrange a consultation with one of our flooring associates. We stay up to date with the latest developments in the industry, providing keen insights on design and remodeling. Hallways and Stairs: Carpet runners are long coverings which can extend down the length of a hallway or flight of stairs. Thanks to their length and coverage, these rugs protect flooring in high-traffic areas. They can also provide traction, preventing slips and falls. Draw Attention: Want to highlight a specific part of your room? Accent rugs in different sizes are a great companion for furniture, seating, and tables. They add to your interior design’s color scheme and visual appeal, all without taking too much of your remodeling budget. 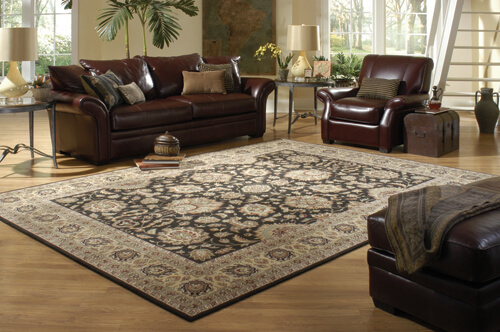 Family Fun: Large floor rugs are perfect for defining common areas like the living room. If your home incorporates hard-surface flooring like ceramic, these rugs can serve as a soft and welcoming play area for young children. Improve the appeal, value, and strength of your property and plan your next project with us. If you are re-flooring a room, let us coordinate your solid surface flooring with the right rug. Our products are excellent complements to solid hardwood, luxury vinyl, ceramic tile, and laminate flooring. Contact us to arrange a consultation for area rugs and flooring. Our showroom proudly serves property owners throughout Flint, MI, including Swartz Creek, Grand Blanc, Davison, Flushing, and the surrounding communities.